Ntchub Education Info For New Student and Returning: Jamb Alert: All the 2017 jamb result is now online. Home / Jamb / Result / Jamb Alert: All the 2017 jamb result is now online. Jamb Alert: All the 2017 jamb result is now online. Goodnews to those that are yet to see their result for the 2017 Jamb examination. 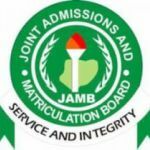 The Joint Admission and Matriculation Board has finally release all the result of the 2017 Jamb exam. You can check yours online with your registered email address in your Jamb profile or your Jamb reg number.